I received a letter from a member of the public during the Easter break in which he stated concerns over the way in which broadcasters cover European politics and the European Union. He noted that the EU is often used as a punch bag, featuring negative stories and ignoring much of the positive work the EU is responsible for. It’s interesting that someone outside of the political arena has noticed this and also the disproportionate amount of air time given to UKIP. I would never quibble with the view that media outlets, both broadcast and print, must be able to set out their stall and express a wide range of views. Even though I may not agree with the content, I do understand that in the interests of balance alternative views must be shared and aired, however this must not be disproportionate in relation to the amount of coverage other parties receive. While I’m not accusing any broadcaster of deliberately behaving in such a way as to favour one political party, it is interesting to me that someone, not directly involved in broadcasting or politics has noticed and felt compelled enough to write to me about their concern. As the referendum approaches it couldn’t be more important to ensure fair, balanced and proportionate coverage of all parties is given. “In the EU referendum debate, how on earth is the general public to make head or tail of the plethora of fictions, nonsense and just occasionally the odd fact coming from campaigners left and right, leave and remain? “Whatever your point of view on the pros and cons of the EU, it seems to me that the media do an extremely poor job of reporting what the EU actually does, how it’s organised and what our elected MEPs do. “In fact I’ve started noting down how often our MEPs appear on BBC News programmes. I regularly see the BBC 6 o’clock News, the local BBC TV news at 6.30, BBC 2‘s Newsnight and BBC 1’s Question Time. On the radio, I regularly tune into the Radio 4 Today programme and also PM at 5pm – so I would count myself as fairly well informed about what the BBC chooses to report. “It only takes a couple of days to relies that the EU is often only featured as a punch-bag, a bureaucratic quagmire or as a source for stories like the ‘tampon tax’. “A particular problem seems to be that if you’re one of the UK’s 73 elected MEPs from all parts of the United Kingdom and representing all political parties, you only get invited to give your views on national news programmes if you’re a UKIP MEP. “In fact, if you start counting up the appearances, you very soon find out that anti EU MEPs Nigel Farage, Paul Nuttall, Louise Bours, Patrick O’Flynn and Roger Helmer are regularly asked to air their views, and whereas since the beginning of 2016 these five UKIP MEPs have all appeared on BBC’s Question Time, of the other 49 MEPs from other political parties who represent us in the European Parliament one hasn’t been able to hear a single word. “Personally I think this is unacceptable, and given the referendum on EU membership on the 23rd June it’s high time the issue of bias was raised. “You can find out for yourself of course who your MEP is – in fact it couldn’t be easier as MEPs’ contact offices, EU emails, Twitter and website details are just a couple of clicks away at http://www.europarl.org.uk/en/your-meps.html Which committees do our MEPs sit on ? How often do they vote? What topics are under discussion in the EU Parliament at the moment? You have to feel sorry for the beleaguered David Cameron. Caught between a rampant Boris Johnson on one flank and his Eurosceptic wing on the other, Cameron clearly doesn’t know which way to turn. Today’s Times reports that Cameron may urge the public in a referendum to support the looser relationship with Brussels he hopes to negotiate. However, Cameron is prepared apparently to give the country the chance to say no to such a deal. Such a result would effectively be seen as a vote to leave the European Union. Although David Cameron has not, as yet, made his well trailed speech on EU membership, he is obviously going in only one direction – a referendum which may well signal Britain’s exit from the EU. Yet before we get there, the Prime Minister will have to negotiate with the EU this much hyped change in Britain’s status. He seeks to take us from the heart to the periphery getting rid of what he and the Tory Party see as troublesome regulations on the way. There is one extremely serious flaw in this approach which is obvious yet almost virtually ignored, namely that the EU may well not play ball. The idea that powers can be “repatriated” from Brussels to London is at present purely a Conservative Party construct. Although Germany may be making some helpful noises, there are those who would be glad to see the back of Britain. While it is true that we are a contributor country to the EU budget that does not necessarily mean there will be unanimous agreement to go along with the Tory demands and negotiate in the way David Cameron envisages. There are, as we all know, very many ways to conduct EU negotiations and since it will be 26 member states against Britain, I would hazard a guess that David Cameron is not in a very strong position. Meanwhile Boris Johnson, according to the Times, would prefer a minimalist EU stripped down to the single market. What this really means is that the social and employment legislation associated with the single market – health and safety at work, maternity rights and much more, will go. This is what the Tories really want. Rights for people at work are, as we know, anathema to many Tories. Withdrawing from one side of the single market while keeping the part the Conservatives see as good for the British economy may just not be a runner. It’s difficult to see how and why the rest of the EU would allow the UK such power without responsibility. David Cameron has a long way to go to realise his dream of the EU allowing the UK to become semi-detached on its own terms rather than those of the EU as a whole. What is more, the CBI, Britain’s foremost business organisation, want Britain to stay in the EU. Cameron is, indeed, between a rock and a hard place, digging an ever deeper hole for himself. 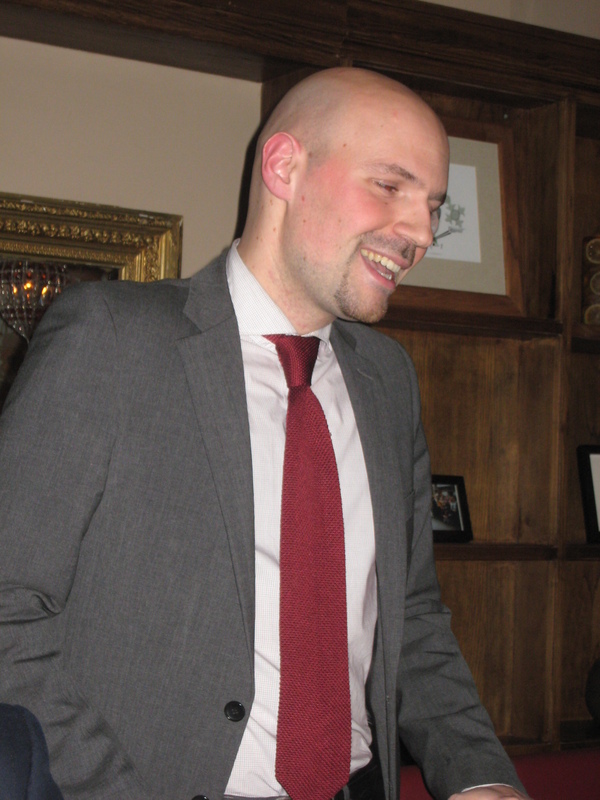 Last week I spoke to the London Branch of the European Movement about my work as a London MEP. Many thanks to Petros Fassoulas pictured standing. Petros is a passionate advocate of the European cause. I am grateful to him and John Preston (far right in picture below) for organising the meeting. 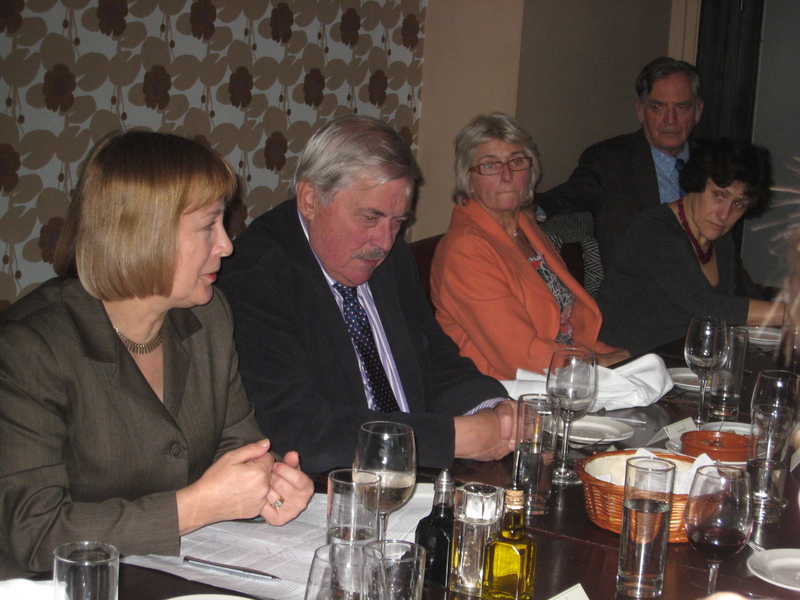 Petros has arranged a schedule of meetings with several of my fellow London MEPs speaking. I would recommend joining these events for anybody interested in European politics, you will be sure of a warm welcome from my experience. 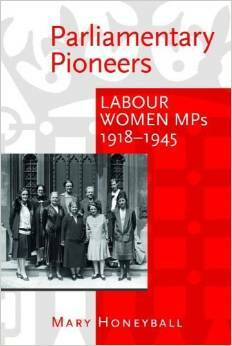 I spoke about my work on women and culture – familar subjects for readers of this blog. However, the European budget was the subject which attracted most interest. I was pleased to meet Liberal Democrat Dinti Batstone who talked about the need to increase women’s representation. 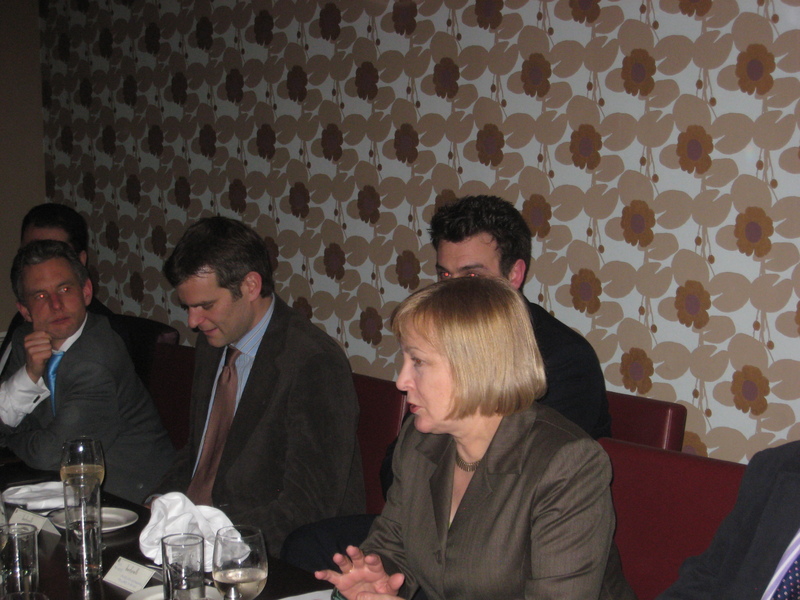 Pictured in orange is Eva Eberhardt an EU gender expert who was keen for a more positive campaigning role on European issues. Many of those present were keen to see a referendum on Europe as they were confident that any referendum could be won. They also considered this would once and for all close down debate on Britain’s role in Europe. It was very enjoyable to be cross examined on European politics by such a well informed audience, my thanks for the invitation. This is an appropriate post to mention in passing that the Labour Movement for Europe will be having their AGM on Monday 13th December at 6pm in Committee Room 5 of the House of Lords.